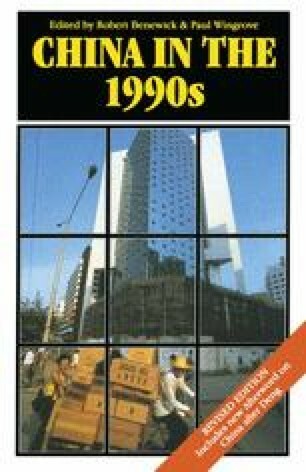 In the second half of 1988 the new Department of Industrial Policy of the State Planning Commission drafted ‘the first systematic industrial policy of [PRC] ‘. In March 1989 the policy was promulgated in ‘The Resolution of the State Council on Current Industrial Policy’. The policy promotes a range of industrial sectors crucial to China’s sustained economic development and international competitiveness. They include the machinery and electronic industry, especially high-value-added machine and electronic products; high-technology industries, particularly space and aviation, new materials, and biological engineering industries; high-foreign-currency-earning export sectors; infrastructure, including transportation and telecommunications; and basic industries, such as energy, steel, and chemical industries. At the same time, a range of industrial sectors will be limited. These include those machine-building industries with low-end technology and those over-developed light and processing industries in textiles, plastics, watches, and some ‘new’ consumer industries like washing machines and vacuum cleaners (Zhang 1992: p. 21).